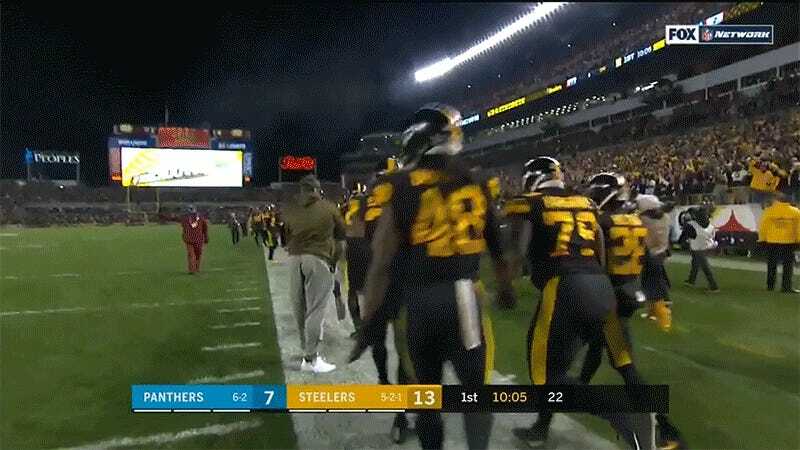 The Steelers are enjoying an explosive start to their game against the Panthers tonight, and after a 30-second sequence that saw the teams score a combined 21 points, the excitement proved to be too much for one Fox cameraperson. With the Panthers backed up deep in their own territory, T.J. Watt rushed Cam Newton and forced him to make an extremely dumb decision, lofting the ball into the center of the field where it was easy pickings for linebacker Vince Williams. Williams took it home, and afterwards, people were falling all over themselves to congratulate him. That play was drop-dead gorgeous.